Aboard the filthy, hot and cramped train and with a burden on shoulders, I managed to find a place and settled. It was a two hour journey. Two hours of boredom, chaos and waiting. It was that moment when I achieved a seat at the window that I breathed easily. The view out of the window changed dramatically – from tall buildings to slums and from slums to huts. Then followed fields of lush green grass and crops, and mountains called Sahyardis – the northern mountain ranges of Western Ghats, standing tall on the plains of Maharashtra. The weather was warm and humid, cloudy and sticky – a good day to explore Karjat, thought I. Do not dream, just see – is the thing one must follow while on a trail. And if you are in a dreamland, see more. See as much as you can. I did that, became isolated from the human world made up of bricks and stones (and enjoyed amidst the hounding and hammering that constantly stalked at the back of my mind. It was those tiny flowers that were hard to be noticed and that tiny ant guarding its nest so bravely that even I could do naught but salute her. It was a chirping Munia and a fishing Kingfisher. It was the South-western winds and the singing of the leaves. Waves on the lake and rush of the streams. It was everything, everything consumed me. I was wholeheartedly obsessed. Dissolved in the depths of the greens, but it was this reality that brought me back. I want to do something for Earth. I have to do something for my home. The trail around the place was nice and pleasant, with beautiful sightings and some satisfying photographs, yet I thought of something amiss. It was time. With so few hours left I tried to behold all the beauty around me. It gives me the strength to be strong, and undeterred. I managed a short trail in the night. But it was on the second day that my wish was fulfilled. While sitting down, bending over and clicking birds at the stream, I got up to change the teleconverter. I wonder why I had to get up, but I did. And I happened to glance below where I sat, casually so, and there it was – flicking its tongue, sensing me, watching me curiously from the thicket. I was as excited as I was nervous. It was a Russell’s viper. Rain was scarce, weather hot and humid, overcast and often windy. Jatropha podagrica - An ornamental plant showing brilliant red inflorescence, it is in fact native from tropical America. Jewel Bugs (Scutelleridae) are commonly seen on this plant. Caesalpinia pulcherrima - Another ornamental tree of the gardens. Vernonia cinerea - A herb of Asteraceae family. Murdannia (wightii/simplex?) 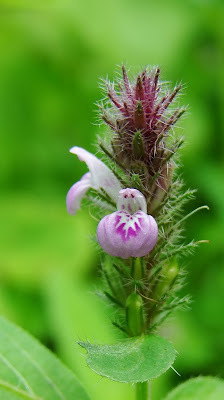 - A small herb with beautifully designed flower can be easily missed. But if only you look carefully will you see it's beauty. Justicia procumbens - An abundant herb, easily seen during the ongoing season. Impatiens (balsamina?) - Another common plant, commonly called Balsam. Abundant during Monsoon, even near railway tracks. Neanotis lancifolia - Another yet beautiful, very small herb dusting the green lawns with pink dots. Trichodesma indicum - Also called Indian Borag, this herb has many medicinal properties. The photograph was taken in it's natural state. The flowers are always head-down! Unidentified flower - Probably in the family of Fabaceae. An entire image showing it's entire length is given below. Neanotis lancifolia - I showed the close-up of the flowers. This is a habitat as well as full-length shot of the entire herb. This herb is Rhamphicarpa longiflora - Many white flowers adorned some patches of grasslands. The leaves were thin and needle-like. Another Unidentified Herb - This is how the Yellow flowered herb looks like. Any idea which one it it? Yet another unidentified herb - Many of these small plants were seen just near the lake - and never far from it. The above herb is Lindernia ciliata. A full-length shot of a flowering grass. The grass in the above image was also very common everywhere. Flowers and Fruits of grass. Scaly Breasted Munias were seen feeding on it. Camponotus sp. - This ant was cheating! It was feeding on the nectar of Bauhinia. So what's cheating in that? Flowers produce nectar to attract insects and thereby help in pollination. But, look at the image above and below - the ant is going directly to the base of the stamens - thereby getting the nectar without pollinating. That's cheating. Another Camponotus sp. (above image) seen busying itself on Calotropis. Many were seen at the base of the leaves. Camponotus sp. are in news again. This time, tending to Aphids (I will speak on it later). So we have Camponotus ants cheating on a flower, doing something 'neath leaves and now tending to Aphids. These ants sure were the most abundant animal at Karjat. Camponotus sericeus (most probably!) (or singularis)- Catch of the day! This is a Morph of the C. sericeus ants - with a large red head. 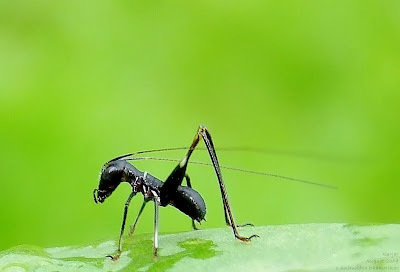 Also considered rare, it is a brave ant with a determination to bite any intruders. I had mentioned of C. sericeus - Common Golden Ants - in the post on "Dandeli-Anshi Tiger Reserve" June 2009. The above image is clearly distinguishable. I am yet to come across C. sericeus around Mumbai region, so this find made me happy :). The ant in the above image, and several of her sisters were defending a Calotropis plant ferociously. They did not like me around them. I then searched the ground - but none were seen on it. I counted about 4 individuals on Calotropis, one of them was smaller as compared to the image above. Tetraponera rufonigra - Commonly called Bicoloured Arboreal Ant, it goes by it's common name. A relative of the ant I posted in the latest Yeoor Hills report. It's sting is nasty! Pseudagrion rubriceps - A beautiful fast damselfly that took a lot of my time running behind them. It was seen at a stream, infact there were so many of these - more damselflies than dragonflies! If you see last year's Karjat post, you will know. The above picture shows a mating pair of P. rubriceps. The above flying one is a male and the lower one in water is female. They layed eggs on grass blades in the flowing streams with approx. 1 feet deep water. The male never let's the female go to lay eggs separately to avoid other males from mating with her. Thus, he ensures that his progeny survives the future. Took a lot of time to capture this moment. It was worth it! Ceriagrion coromandelianum - Another damselfly that was seen pretty far from any waterbody - this is very usual of C. coromandelianum. Trithemis aurora - A male T. aurora carries crimson colour that literally glows. It is a small and cute dragonfly, fond of streams. Potamarcha congener - The above image shows a female Dragonfly. Dimorphism in sexes is clearly distinguishable in Odonata, and many scientific as well as common names are derrived from the colours displayed by the males - which are most colourful than their counterparts, females which carry a rather drape colour combination. Trithemis festiva - Another cute and dark blue coloured Libellulid, it is rather fond of forest streams, but there were 3 of these at this rather-open stream. Can you spot-the-mantis in the above picture? That's a Bark Mantis. Orthoptera nymph - An interesting find according to me. If you compare the above critter with the Camponotus ants, you might even think that this nymph mimics those ants. That's what I thought. It was sitting pretty on Calotropis leaf, very small in size. I dont think it is that of a Grasshopper (Caelifera), I would strike out Katydid (Tettigoniidae) nymph also. Perhaps it is the nymph of a Cricket (Gryllidae) due to thick femur, tiny visible cerii and my bet. Danceflies - These really tiny flies, getting nectar out of Neanotis lancifolia, were seen by chance. I happened to lay down to click these pretty flowers being tended by the flies. And by chance, two of them started dancing! Danceflies belong to Empidae. They dont actually "Dance" but their "displays" seem as if they are dancing - as is one of the flies in the image above. Aphids - Every gardenists' nightmare and every farmer's worst enemy. These tiny rather cute looking bugs are considered pests all over the world. Their size is almost 2 to 3 mm, really small - but it's their sheer number and the way they reproduce that is of concern to us. They give birth to live young ones, and u will see many of these as tiny yellow dots in the image above. Aphids belong to Hemiptera - and feed on plant sap. Ants tend to these bugs for their sugary excretions, and thus get protected in return. Many were seen on Calotropis. Mud Dauber Wasp -A mommy wasp was busy bringing food for her youngones in her home. Mud dauber wasps are one of the extremely nice mum wasps. They build a "nest" like in the picture above and lay eggs. Then they go to hunt for food such as insects, sting them and thereby paralyse them - and bring them back to their nest. The paralysed prey do not die, they just can not move. After stacking the nest with enough food material...see the next image. ...the Wasp closes the door to her nest, and flies off. Now the home contains lots of food and eggs. The eggs hatch - devour the prey - break open the locked house - and fly away. A Nettle Caterpillar - Probably that of Limacodidae, those thorny spines can give a nasty sting. Agaristinae sp. 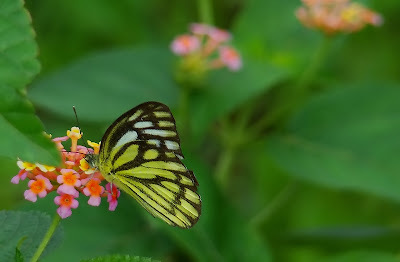 - A pretty moth very common during Monsoon, the last Yeoor Hills post contained it's picture. This time, it was attracted by the light and preferred posing in the above manner. 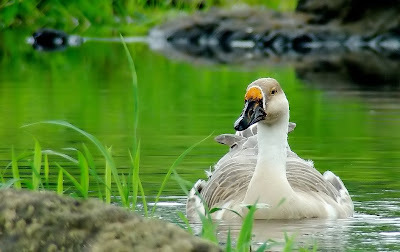 The image below show's it's upper-wings. Plain Tiger - A very common, beautiful butterfly basking in the sun. Dark Grass Blue - A tiny Lycaenid butterfly. Danaid Eggfly - Male - Very common during this season. Males are territorial and are often seen shooing away rival males. 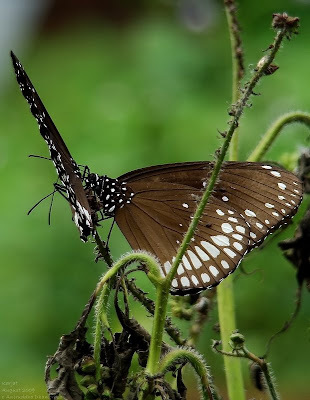 Its a treat to watch these butterflies "fight", for it seems as if they are dancing! Common Gull - Seen here sipping nectar off Lantana camara. A weed that got so used to our forests that it is not surprising to see it in dense forests. It is one serious insect attractant and a good one to experiment photographing butterflies. Also used abundantly in "Butterfly Gardens". Common Indian Crow - Seen here getting "that extra potion". The damaged plant is Heliotropium indicum. If you read SGNP report posted in July 2009, you will know for sure. Above image is that of a "Spider Retreat" rather a house of a spider. It was small and covered by a thin layer of silk, like a door - probably to keep rain away. Two-tailed Spider - Belongong to Hersilidae, these "bark" dwelling spiders are excellent camouglage. This fellow was photographed in the night. Commonly called so because of two "Tail" like projections at the end of the abdomen, which is in fact two spinnerets - from where Spiders spin their silk. Hanging by own silk? - A title suiting the above picture, only thing is it doesnt mean the spider commited suicide. It is actually a Spider-molt. Lets not forget spiders are Arthropods - and to live, they must molt. The above molt was that of a Nursery Web Spider, Family Pisauridae (See SGNP June 2009 Post). Daddy-long Legs! - A common sight, eeky and... ugly. No way one likes them walking on them! But worry not! They are our friends! Keep mosquitoes and dust away, however spoil the decor of home. They are tiny and may seem brain-less but are loving mothers. Will guard the eggs as well as spiderlings dearly. Rana tigrina - a big fat frog, put on the brink of near extinction, thanks to our apetite for frog legs! Things have changed now, however. This fellow still has a future. Polypedates sp. - A Tree Frog. It was nicely perched high on a pipeline, and we were extensively searching for it in the thickets! Rana malabarica - Commonly called "Fungoid Frog" since it "emits" a kind of fungi-like smell. I have never observed it. A Western Ghat endemic, it is one of the beautiful frogs seen around Mumbai. It was high on my wish list, higher still during night trail, but I stumbled across this fellow sheltered in a concrete hole on the next day. You always find the unexpected in unexpected places. This is what makes wildlife an addiction. Unidentified Gecko - Perhaps a Bark Gecko? I have no idea. Skink - Probably Brahminy Skink - beautifully jucilicious for snakes. It was seen licking its lips after a nice snack of ants! 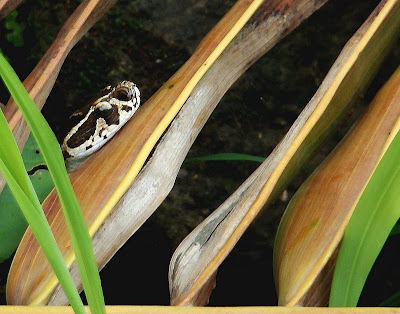 Daboia russelii: Russell's Viper - Dream come true! ...and it vanished into rocks. Black Shouldered Kite - Seen hovering over the lake. Little Cormorant - Shot late in evening. Mystery bird - I bet on Pied Cuckoo. Indian Robin - A juvenile, seen feeding on the ground. Fence - Something that separates us from nature. Goats feasting on lush green grass. A merrry sight, but mere sign of destruction. It is of growing concern to the Forest Depts., keeping shepherds at bay from the Protected Areas. Water summed upon forestland by the Dam. your UNIDd grass flower is also listed on flowers of India..
was searching for a name of a white flower which grows in grass. The most amazing view of Karjat I have ever seen and I go to Neral on work at least twice a month. The grass is called poa pratensis, or possibly poa annua, and it's everywhere because it's an invasive weed outside of its natural range.